Democrats are the best party for the stock market except . . . Given the incredibly bitter political partisanship affecting the country right now, it only seemed right to throw fuel on the fire by asking an incredibly incendiary question like: which political party is better for the stock market? The stock market is a tricky mistress to the political parties. Republicans seem to openly court this mistress with their pro-business and more capitalist policies. When the stock market does well that is seen as a success. Ronald Reagan’s trickle-down economics would have the stock market winners, who tend to be clustered among the wealthy, spend more and benefit everyone. Most recently, Donald Trump has hailed the tremendous bull market during his presidency as a sign that his policies are working. In case you’re curious, the S&P 500 is up over 15% since he was elected. That’s pretty good, but certainly not the best. Since 1950, of the 10 presidents who became president after being elected (I’m not counting Johnson or Ford), Trump ranks 3rd highest, behind John Kennedy (23%) and George HW Bush (25%) over similar time periods. It’s a bit more complicated with Democrats with their more progressive agendas and socialist policies. But make no mistake, Democrats want stocks to do well too. Good stock markets are correlated with low unemployment. When the stock market does well tax receipts are up. One of the core bastions of Democrat ideology, the pension fund for public employees is nearly totally dependent on a strong stock market. Whatever, that’s all politics. You can agree or disagree with my thinking, but I don’t think there’s any doubt that both parties want the stock market to do well. So that leads to the big question: which political party does better with the stock market? There have been 37 years of Republican presidents and 30 years of Democrat presidents. The average return for Republican presidents is 5%, for Democrats 12%. Clearly DEMOCRATS are better, but wait . 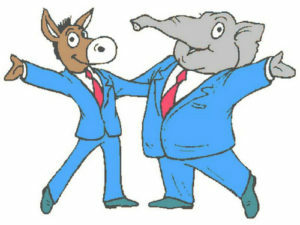 . .
Republicans have controlled both chambers of Congress 15 years, Democrats 40 years, and it has been split 12 years. The average return for Republican Congresses is 14%, Democrat Congresses 6%, and split Congresses 8%. Clearly REPUBLICANS are better, but wait . . .
Republican presidents have had a Republican Congress for 7 years where the average return was 12%. Democrat presidents have had a Democrat congress for 18 years with an average return of 10%. Clearly REPUBLICANS are better, barely, but wait . . .
Republican presidents have served with Democratic Congresses for 22 years with an average return of 3%. Democrat presidents have served with Republican Congresses 8 years with an average return of 16%. Clearly . . . wait there’s nothing clear about this one. Who should get the blame for those below average Republican president/Democrat Congress years? Who should get the credit for those really, really good Democrat president/Republican Congress years (that was mostly during Clinton’s administration)? There’s a lot of ambiguity here, and I don’t think there’s a clear answer. We could argue about it on Facebook, but that’s about as fun as a root canal. No thanks. Since 1950 the US stock market has done really well, amazingly well. In November 1950, the S&P 500 was at 19.51; today it’s at 2480.91. Let that sink in for a minute. All that data I showed you was valuable to see in that it confirmed we are on a bit of a fool’s errand. Asking if Republicans or Democrats make the stock market do better is the wrong question. The important observation is that the stock market does well no matter who is running things. If you’re an optimist that means either party is filled with good stewards who keep things going in a positive direction. If you’re a pessimist that means the the American economy is so strong and robust that the idiots in Washington, on either side of the aisle, can’t screw things up. Either way, that is a tremendously powerful and important and comforting insight. The day after Trump was elected, the stock market had a really good day, rising 1.1% (Reagan’s day-after-election rise was 1.8%). That was based on expectations of tax reform, reduced regulation, and healthcare reform, to name a few. So far, pretty much none of that has come to pass, yet stocks are up 15%. How different would that have been if Hillary Clinton was elected? Maybe she doesn’t sign some of those executive orders on the Keystone pipeline. Maybe she doesn’t rollback some of the regulations Trump has, maybe she adds some he hasn’t. All maybes. But those are all drops in the bucket compared to the gargantuan size of the US economy and the stock market which reflects it. My absolute belief is that a strong US stock market reflects a strong US economy and business environment. Awesomely, that goes beyond the power of one person in an oval office or 535 people down the road a bit. We will win no matter who is there, and that makes things a lot easier. So my answer is: Republicans are better for stocks but Democrats are better for markets. Wait, maybe Democrats are better for stocks and Republicans are better for markets. I forget now. Damnit. *All analysis in this post is based on the S&P 500 since the midterm election in November 1950. Really interesting statistics and viewpoint on this. I always feel calmer after reading your stuff.